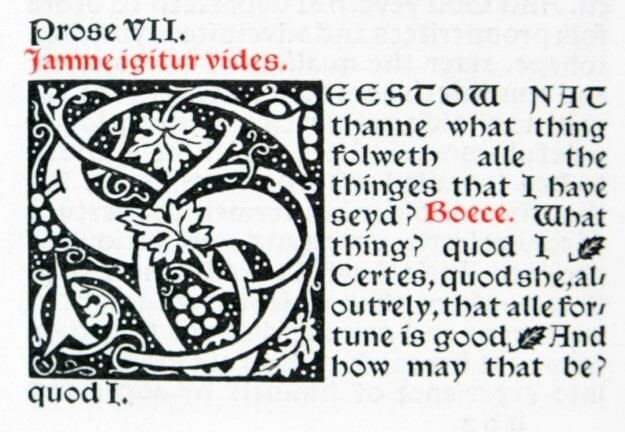 It is difficult to choose a favourite item in Trinity College Library’s collections but one of mine is the Kelmscott Chaucer, shelfmark Press B KEL 1896 2. It is not particularly colourful – red and black are the only inks used, and the former only sparingly – but despite the unpromising binding of Trinity’s copy it is a beautiful book. How can you not admire the sheer amount of work involved in designing and creating it? 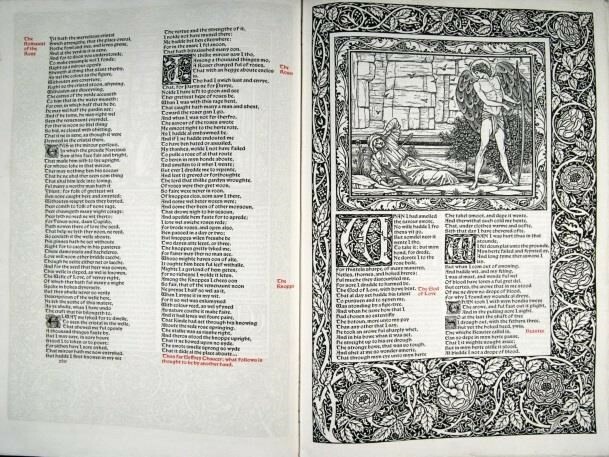 William Morris (1834-1896) set up the Kelmscott Press in 1891, making it one of the earliest private presses. In the seven years of its existence, the press produced a staggering 52 works in 66 volumes. (It was not a private press in the strictest sense of the word as Morris did employ workers but it only published limited editions of material he chose and he had full control of every aspect of production. He admired early calligraphy and typography and said: ‘I began printing books with the hope of producing some which would have a definite claim to beauty, while at the same time they should be easy to read’ (1). Morris was in no doubt that his books should be printed on hand-made, chemical-free paper and was delighted to find that Joseph Batchelor in Little Chart, Kent was able to produce some for him modelled on a fifteenth-century Bolognese example. 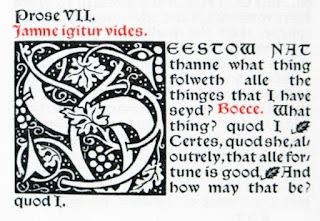 Although not keen on vellum, Morris realised that some collectors preferred it and printed a small number of vellum copies of most of the Kelmscott Press titles. He managed to find two suppliers in England who could meet his high standards after the Vatican bought up most of the good Italian vellum. In fact, although the book is printed on paper, TCD’s copy of the Chaucer has two vellum leaves bound in at the back which were trial pages for Froissart’s Chronicles. Morris intended to publish this in two volumes but later abandoned the project. Morris had strong views on layout, spacing and type, saying that ‘the letters should be designed by an artist, and not an engineer' (2). He spent a good deal of time examining enlarged photographs of existing typefaces and drawing his own fonts, even rejecting some letters after they had been engraved to his specification (3). Each book produced by the Kelmscott Press was in one of three fonts, all designed by Morris and cut by Edward Finch: Golden (based on Roman type), Troy (based on Gothic black-letter type) or Chaucer – this last being simply a smaller version of the Troy created when he realised the larger variant was just not practical for such a large book. Finding ink to satisfy Morris was far more difficult than sourcing either paper or type had been. He contemplated making his own, but never did, instead trying a variety of suppliers. His friend Emery Walker, who later set up the Doves Press, came to his rescue by suggesting Jänecke of Hanover, whose inks were untainted by “those damned chemists” as Morris saw them. However, this was very stiff ink, making it extremely hard work for the pressmen and nearly causing a strike (4). After further trials of other suppliers, and much correspondence between Kelmscott Press and Gebrüder Jänecke, Morris settled on a thinned-down version of their black ink and a vermillion produced by Winsor and Newton of London (5). 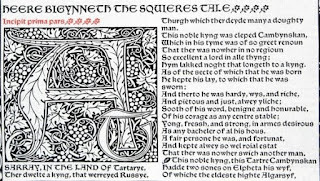 Morris began speaking of producing an edition of Chaucer’s works as early as June 1891 (6) and the illustrations were mentioned rather excitedly in The Athenaeum on 22nd October 1892 under the heading “Fine-art gossip”. The Book Buyer (a periodical published in New York) declared on 18th November 1895 that it would be ‘without question the grandest book of the century’ (7). Morris, an inveterate doodler (8), designed decorative initials, small devices, 14 large borders and 18 image frames for the work, as well as the title page. His old friend Edward Burne-Jones, with whom he had read Chaucer aloud when they were students at Oxford, provided 87 illustrations. The woodcuts were engraved by Charles Edward Keates, Wilhelm Spielmeyer, George Campfield and William Harcourt Hooper, although Robert Catterson-Smith had to simplify Burne-Jones’s very detailed drawings for Hooper. Printing began on 8th August 1894 (9) and was finally finished on 8th May 1896. 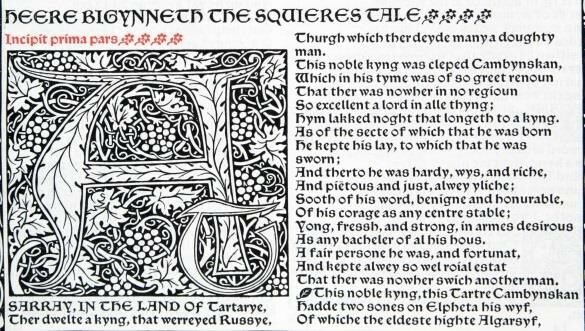 438 copies (425 paper and 13 vellum) of The Works of Geoffrey Chaucer; now newly imprinted, probably now the bestknown work from the press, were published. A glowing review in The Athenaeum on 3rd October 1896 stated ‘In its own style, the book is, beyond dispute, the finest ever issued’. All images (including the flowers) are from The Works of Geoffrey Chaucer; now newly imprinted, TCD shelfmark Press B KEL 1896 2. (1) A note by William Morris on his aims in founding the Kelmscott Press together with a short description of the press by S. C. Cockerell, & an annotated list of the books printed thereat (London, 1898) p.1. (2) William S. Peterson (ed. ), Essays and lectures on the arts of the book by William Morris (California, 1982) p.69. (4) Emery Walker in a letter to John Johnson, quoted in William Morris and the art of the book (New York, 1976) p.82. (5) William S. Peterson, ‘William Morris and the “Damned Chemists”: the search for an ideal ink at the Kelmscott Press’ in Printing History, 3:2 (1981) p.7–11. (6) A note by William Morris... p.44. (7) Peterson, The Kelmscott Press p.228. 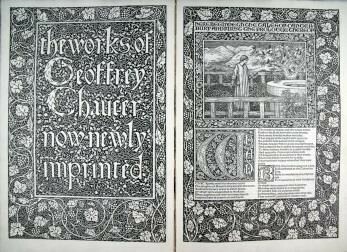 (8) H. Halliday Sparling, The Kelmscott Press and William Morris, master-craftsman (London, 1924) p.67.